On 27th March 2019 TS Blue Clipper will be arriving in Havana, Cuba after 8 days of sailing from the beautiful Cienfugeos……. So, what delights does Havana have to offer the crew and guests as we throw down the anchor and explore the beautiful streets of Havana? When we started to look into things for our crew and guests to do in Havana, we came across some interesting facts which we thought we would share ahead of the March voyage! It would seem that Ernest Hemingway, famous Author of The Old Man Of The Sea was very fond of Cuba and he has definitely made his mark in Havana. It is said that Ambos Mundos was where Hemingway’s love affair with Cuba all started. Ambos Mundos houses the legendary author’s former hotel room in Havana, a fraying Art Deco hotel in the heart of the Unesco-listed old quarter. From behind Hemingway’s typewriter in room 511, where he wrote three novels standing up because of an old knee injury from the war, you can see the terracotta rooftops sliding off towards the old harbour, with the currents of the “great blue river”, his name for the Gulf Stream, threading through the ocean beyond. Ernest Hemingway first visited Cuba in 1928. It was only for two days, but it was enough time for him to fall in love with it. From books such as The Old Man and the Sea to Islands in the Stream, this became the country of Hemingway’s imagination and one where the author lived on and off for more than 30 years. In room 511 of the Ambos Mundos, you can see Ernest’s Louis Vuitton travelling trunk, his size 11 shoes, and a mini exhibition of artworks given to him personally by the likes of Picasso. Hemingway’s regular route from the hotel would take him around the corner to La Bodeguita del Medio, a bar tucked into a narrow street that serves up his much-loved mojitos by the half-dozen. Then he would visit El Floridita to down daiquiris en route to the Sevilla hotel, where he slept. It’s a straight walk down Obispo street from the hotel, so what better way to walk in the legend’s shoes than by doing a Hemingway bar crawl? Outside, Havana’s 500-year-old streets you can often hear the cacophony of percussive music that is a signature of this soulful city echoing up the alleyways. We recommend finding yourself a perch at La Bodeguita’s little bar and watch the barmen whip up a batch of mojitos with lime juice, white rum and fresh mint. Cigar smoke mingles here with music in the cramped but colourful space, and graffiti is scrawled over every inch of each surface. The author’s famous tribute (“My mojito in La Bodeguita, my daiquiri in El Floridita”) is framed above the bar – Havana’s most famous barfly made sure to leave his mark. In his book Islands in the Stream, Hemingway says that they (the daiquiri’s) “had no taste of alcohol and felt, as you drank them, the way downhill glacier skiing feels running through powder snow”. Apparently he held court here at the end of the bar with the likes of Spencer Tracey and Errol Flynn. Today his seat is still taken by a life-sized statue, and you can still order the special Papa Doble – Hemingway’s variation on the daiquiri with a double shot of rum and no sugar. Visit another Hemingway haunt, Sloppy Joes, a large airy bar dating to 1917 and half-way between El Floridita and the Moorish-style Sevilla hotel. 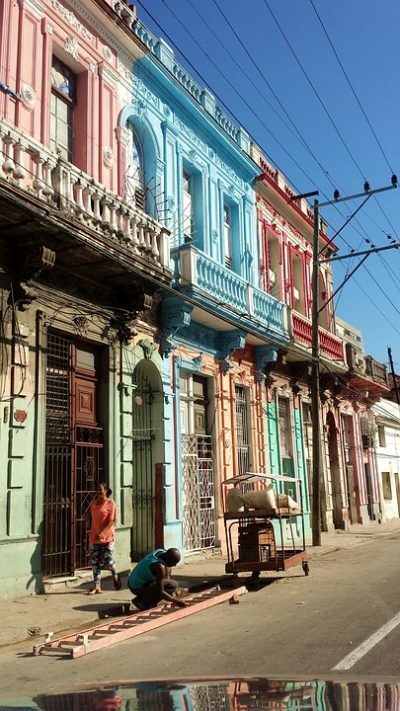 It’s easy to see why writers like Hemingway would revel in Havana’s streets. A magical place full of Dickensian intrigue, its candy-coloured colonial buildings are seemingly propped up with sticks; pensioners dance to “Guantanamera”; neighbours gossip over wrought-iron balconies; and gaping doorways reveal tattoo parlours, barber shops and furniture workshops. Tributes to the author can be found throughout Havana, right down to the modern Marina Hemingway, where the annual Hemingway International Billfishing Tournament is held. When he wasn’t writing, Hemingway liked to fish for marlin and his sturdy boat, Pilar, is dry-docked next to the empty swimming pool in the Finca’s tropical grounds. He would board the Pilar in the nearby fishing village of Cojimar, a serene cove where he found inspiration for The Old Man and the Sea. In fact, he dedicated his Nobel Prize for Literature to the town: “This is a prize that belongs in Cuba, because my work was conceived and created in Cuba, with my people of Cojimar where I’m a citizen.” After he died, the locals donated propellers from their boats to be turned into a metal bust of Hemingway, which can be found sheltering under a brilliant blue pavilion next to the tiny 17th-century fort. Hemingway had a magnificent stomping ground to patrol for marlin in the slip of the 12-mile-wide Gulf Stream on Cuba’s cay-strewn north coast, whilst it said that his wife Martha preferred to snorkel among the islands’ pristine coral reefs including Cayo Jutias, Cayo Levisa and Cayo Paraiso by boat. Finally, before you leave the Hemingway trail, we recommend that you sample ‘Havana at sunset’. Join the locals on the Malecón esplanade, grab a cone of fried banana from a snack cart and watch anglers toss lines into the frothing sea. Even if all you do whilst in Cuba are to follow in Hemingway’s footsteps you will find yourself on an incredible city and beach break, revealing a country little changed from the one he himself knew so well. No wonder he never wanted to leave. We hope to see you there in March 2019 on board TS Blue Clipper!